Click here to visit the Daily Break site and register. Then click “start” and take their quick quiz. Next create an e-card and you’ll be able to score a coupon good for $1 off any Sara Lee Snacks 10oz. or larger. 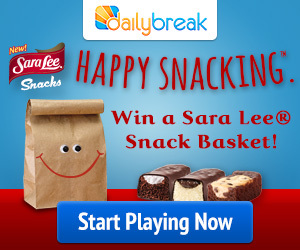 You’ll also be entered to win 1 of 10 free Sara Lee snack baskets.